The Mela takes place in the beautiful setting of the city’s Kelvingrove Park on Sunday 24th June 21018 – and admission is completely FREE! The festival, which is the biggest of its kind in Scotland, will have three main stages and artists from across the UK and the globe will be bringing a taste of world music to leafy Kelvingrove Park. Bhangra superstar Miss Pooja will headline a wildly eclectic and colourful line-up including dhol drumming, steel band, Roma folk, sufi, plenty of irresistible bhangra beats and so much more. 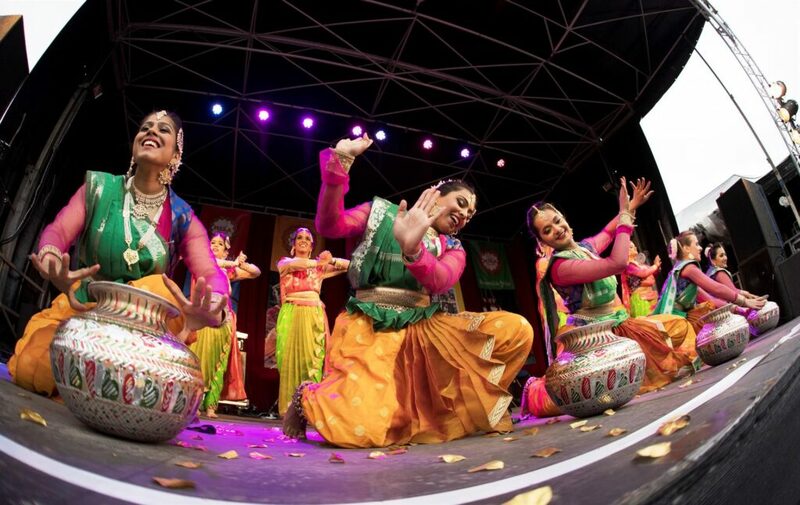 The Glasgow Mela prides itself in being a truly multi-cultural festival which reflects the diversity that exists in Glasgow and indeed in Scotland. As well as the popular bhangra and bollywood acts, the Glasgow Mela presents a vibrant mix of international music from Russian Folk, to reggae and Latin American beats. A diverse programme of music, dance and performance will take place over three stages, plus roaming acts who will be appearing intermittently around the park. Glasgow Mela – Scotland’s biggest free multicultural festival – bursts with live music, theatre performances, exotic and mouth-watering foods from around the globe and fun for all ages and we are back on Sunday 24 June at Kelvingrove Park! The Glasgow Mela is the best way to enjoy a fabulous summer day in the city with live music, dance, entertainment and arts. As ever Glasgow Mela brings with it the Mela Bazaar, selling an eclectic mix of gifts, accessories, textiles, scents and more. And a host of caterers are signing up to serve an exciting variety of delicious, high quality foods from around the world throughout the festival. With vibrant music, colourful dance, interactive arts as well as plenty of family fun and youth entertainment all set in the leafy backdrop of Kelvingrove Park in the city’s West End, Mela is truly a festival like no other. For a complete photographic guide of Glasgow Mela 2010 visit pictureglasgow.com You will see a huge selection of candid shots of people and events throughout the day. Check it out. See you on the 20th. Pics available Sunday night onwards. Many more photographic features available to see on the site now.